EDITOR’S NOTE: The Diocese of Rochester released the statement below in response to a June 6 press conference at which attorney Mitchell Garabedian alleged that eight men currently or formerly associated with the Rochester Diocese – including four who are deceased and one who resigned from ministry and was dispensed from the clerical state in the late 1970s – committed sexual abuse during their years of ministry. 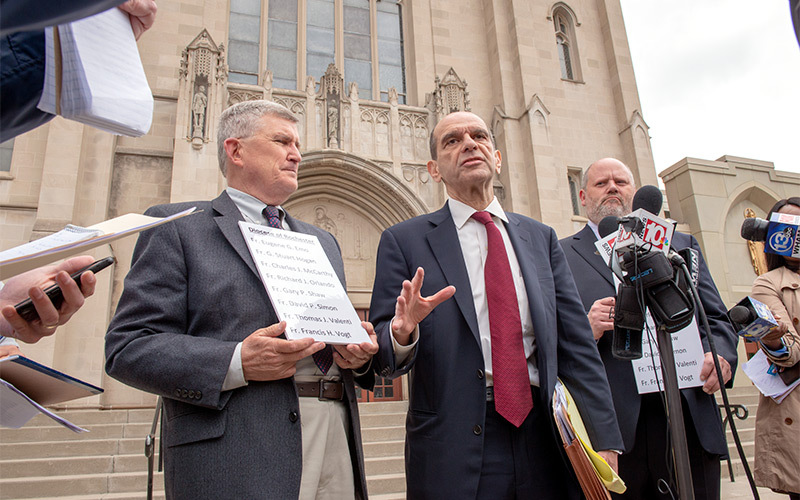 The Diocese of Rochester has been in correspondence for several months with the Garabedian law firm regarding the individuals named publicly at the news conference today. The Diocese has invited participation in a process of investigation and resolution. We have had little or no response. The Diocese has never received any complaints of clergy sexual abuse of a minor against Fathers G. Stuart Hogan, Charles McCarthy and Richard Orlando, each of whom retired as a priest and are now deceased. The Diocese never received any complaints of clergy sexual abuse of a minor against Gary Shaw, who resigned from ministry in 1977 and was dispensed from the clerical state in 1978. The allegation against Father Thomas J. Valenti was investigated, reviewed and determined to be unsubstantiated. No further complaints of sexual abuse of a minor against Father Valenti have ever been received. The Diocese of Rochester treats all claims of abuse most seriously and has done so for decades, long before the United States Conference of Catholic Bishops issued the Charter for the Protection of Children and Young People in 2002. To assist in the resolution of any claim of clerical sexual abuse of a minor – regardless when it is alleged to have occurred – the Diocese has retained Hon. Robert J. Lunn, a retired New York State Supreme Court, Appellate Division, Justice whose practice currently concentrates on mediation and arbitration of civil claims. Justice Lunn, who is a Member of the National Academy of Distinguished Neutrals, is a partner in the firm of Trevett Cristo, P.C., in Rochester, New York (www.trevettcristo.com). While on the bench and also in private practice, Justice Lunn has had extensive experience in reviewing, assessing and resolving claims of sexual abuse. If a claimant consents to participate, Justice Lunn will review all required documentation relating to the claim, evaluate the merits on a case-by-case basis and make a final decision regarding appropriate compensation for the victim. When administering any claim of clerical sexual abuse of a minor, Justice Lunn will serve independently of the Diocese. His decision regarding will be final. The Diocese has agreed to accept his determination without appeal. “I again wish to re-state to the victims and all the faithful my deep sorrow, regret and empathy for those who have suffered so grievously the sin of sexual abuse. I continue to offer fervent prayers for those who have been hurt and betrayed, and I ask all the faithful to join with me in these prayers,” said The Most Reverend Salvatore R. Matano, Bishop of Rochester. Victims of clergy sexual abuse of a minor are encouraged to contact civil authorities. To receive help and guidance from the Roman Catholic Diocese of Rochester, please contact Mrs. Deborah Housel, victim assistance coordinator, at (585) 328-3210, ext. 1555, or toll-free 1-800-388-7177, ext. 1555 or by e-mail to victimsassistance@dor.org. Upon receiving notification of any such claim, regardless when it occurred, the Diocese, in addition to promptly notifying appropriate civil authorities, conducts its own investigation, which is reviewed by an independent Review Board of experts in law, child protection, law enforcement and psychology.